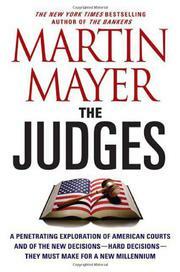 A brief history, a current assessment and, finally, a plea for reform of America’s courts. Alexander Hamilton was, perhaps, never more wrong than when he characterized the court system as “the least dangerous branch” of the proposed new American government. Over the past 200 years, the courts have emerged to an astonishing extent as the final arbiters of the rights and duties attendant to our democracy. With this authority comes an enormous capacity for mischief. Who are these people who wield such great power, these judges, some 30,000 of them, who handle 92-million cases a year? Mayer (The Fed, 2001, etc.) answers this question and much more, though he has little patience for high flown talk about the rule of law, the role of law or the glories of the adversary system. Instead, he insists on examining the federal, state and county court system as it is: overburdened, understaffed, out-moded and thoroughly unprepared to address the problems of the 21st century. Intended for the general reader, his well-reported, informal narrative identifies our blind adherence to lofty myth and hopeless politicization of the courts as the chief obstacles to reform. Interpolated throughout are chapters devoted to specialty courts that appear to work well—the federal tax court, the so-called “therapy” drug court in Brooklyn, the Colorado water courts—and these vignettes prepare the reader for Mayer’s proposed remedy. No honest observer of our courts at work can wholly approve of them. We are, he argues, long past the time when our disputes ought be handed over to those who owe their robes to political activity. Writing from a frankly disclosed center-left perspective, he insists that we do more to protect the independence of the judiciary, increase efforts to educate and train judges to judge—quite a different thing from training lawyers to advocate—and move increasingly in the direction of problem-solving, specialty courts, familiar with the discourse of other learned professions. Mayer’s industry, his obvious good will and humor persuade even those opposed to his politics or leery of his proposed solutions that he just might be right. WHATEVER HAPPENED TO MADISON AVENUE?